Recently, I had the luck to catch a duo show of Mary Halvorson and Ingrid Laubrock at the intimate JACKArts space in Brooklyn. I was struck by how well their melodic ideas and abstract inclinations played off each other so well. I assume that their various associations, like their work with the Tom Rainey Trio, has helped them develop these tacit connections. The same probably could be said about Laubrock's work with pianist Kris Davis, from their trio work with Paradoxical Frog which has produced some excellent recordings as well. Now, add in the powerful but subtle percussion of Tom Rainey and the assured bass playing of John Hébert (a member of Halvorson's Trio), and as you probably have already guessed, we end up with a brilliant combination of Laubrock's many associations, each one bringing creative and edgy playing to a strong set of compositions. 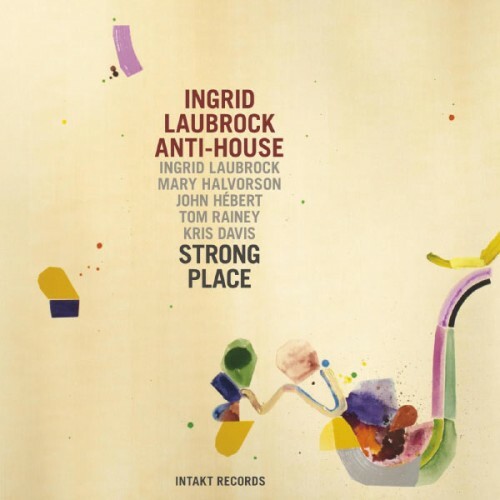 Indeed, Laubrock's compositional skill is the linchpin of 'Anti-House'. Her songs carry strong melodic stamps even as they veer far from the expected. Songs like 'Count 'em (for Richard Forman)' juxtapose catchy lyrical snippets with unexpected rhythms and textures, but still allowing each musician to poke through the relaxed atmosphere. The following 'From Farm Girl to Fabulous, Vol 1.' has a cheeky title and music that begins free, atonal and rhythmically unkept, but begins picking up a more strident rhythmic base courtesy of some single note motifs from Davis' piano -- the tune even get a bit rocky as it unfolds. Anti-House, to my ears, is a little less aggressive than some of the other avant-jazz combinations that the various members are in but it is no less energetic and powerful. I offer 'Alley Zen' as an example. Rhythmic piano figures like something from a Nik Bärtsch modul spiral below accentuated phrases from Halvorson's crisp guitar. This same type of interaction also works beautifully between everyone in 'Cup in a Teastorm (for Henry Threadgill)', where a Hébert, Davis and Rainey trio sustains the song for an extended sequence. Accessible and abstract it works quite well and I am enjoying repeated listenings to Strong Place immensely. It is a strong statement of Laubrock as a composer and leader of a choice quintet. Good review. Album of The Year for me so far in 2013.